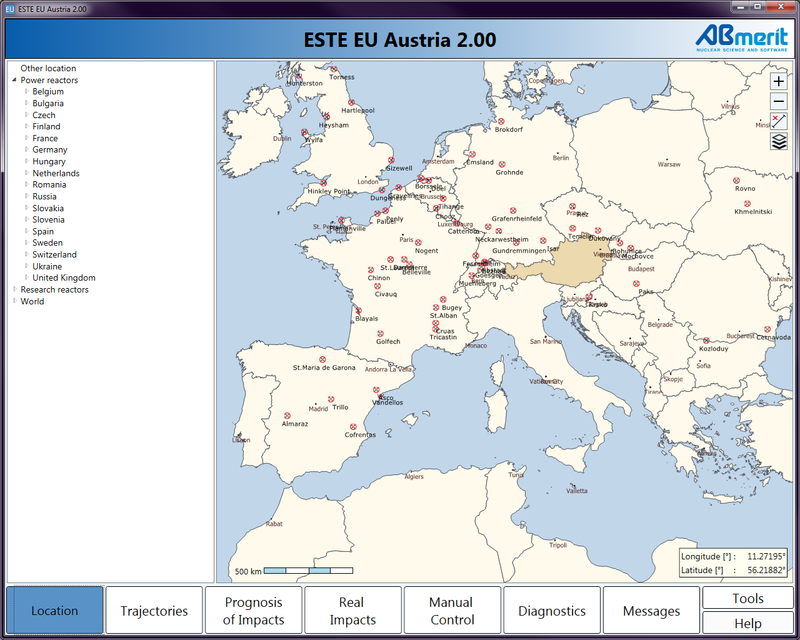 ESTE EU is information system and software for radiological impacts assessment to the territory of the country (Czech Republic, Austria, Bulgaria or other country) in case of any radiation accident outside or inside the country (Czech Republic, or other country). The aim of the system = to be able to propose possible protective actions to the impacted territory. System enables to estimate prediction of the source term (release to the atmosphere) for any point of radiation/nuclear accident in Europe (for any point of the release, but especially for the sites of European power reactors). Information about threat of impacts (especially information about possible threat of urgent protective measures) to the selected territory is automatically generated by the system. The system is assimilated to the conditions of the Czech Republic, Bulgarian Republic, Austria and the IAEA. System is implemented at the State Office for Nuclear Safety, Prague, at the Nuclear Regulatory Agency in Sofia, at the Crisis Centre of Austrian Federal Ministry of the Environment (BMLFUW) in Vienna and at the Incident Emergency Centre of the IAEA, Vienna. The school version of ESTE EU is implemented at the Department of Dosimetry and Application of Ionizing Radiation, Faculty of Nuclear Physics and Physical Engineering - Czech Technical University in Prague. Power reactors: Information about every one European power reactor and database of source terms for every one European power reactor is implemented in the system. Research reactors: Information about every European research reactor is implemented in the system. World reactors: Information about every non-European nuclear power reactor in the world is implemented in the system. System enables to estimate prediction of the source term (release to the atmosphere) for any point of radiation/nuclear accident in Europe (for any point of the release, but especially for the sites of European power reactors). The system enables to utilize results of real radiological monitoring in the process of source term estimation. For this purpose especially early warning system data (measurements of dose rates) from the territory of the country (Austria) and from the territory of other countries are used, in case of Austria: Germany, Switzerland, Slovenia, Croatia, Hungary, Slovakia, Czech Republic. Radiological impacts of the release to the atmosphere are modeled and calculated across the Europe and displayed in the geographical information system (GIS). Information about the threat of impacts (especially information about possible threat of urgent protective measures) is automatically generated by the system. Modeled real radiological situation (the map of "real impacts"), once calculated, is in regular time intervals compared with real monitoring data and method of correction is applied. The aim of this correction, performed on the base of monitored dose rates measured by early warning systems detectors situated over the countries, is to make the calculated real radiological impacts more realistic – to make displayed radiological situation as realistic as possible. Dispersion of radioactive gases and aerosols in the atmosphere (in European scale) is modeled by PTM method (Puff Trajectory Model) and (alternatively, according to the choice of the user) by LPM method (Lagrangean Particle Model). Numerical weather prediction data from the ZAMG are used for both models at the BMLFUW. The point of release /the location of accident can be entered manually by user at any point in Europe (not only at the locations of NPPs or at the location of research reactors, but at any point). Numerical weather prediction data (NWP) are automatically read by the system (from specific shared directory at the BMLFUW). Dose rates measured by early warning systems on the territory of Austria, Germany, Switzerland, Slovenia, Croatia, Hungary, Slovakia and Czech Republic are automatically read by the system (from specific shared directory at the BMLFUW). Predicted source term or real source term can be generated by the system ESTE or entered to the system by the user in parallel from many locations on the map. It means that radiological impacts of releases from various places can be modeled by the system at the same time (and can be reported and displayed on the map of impacts as common impacts of all events). Multiunit source terms and multiunit impacts are modeled by ESTE in parallel, at the same time. All radiological impacts are calculated as impacts of (up to) 55 nuclides. The list of pre-calculated source terms in the database of ESTE EU is described in relevant Chapter. Source terms for reactor events and spent fuel pool events are prepared for every European reactor, differently for PWR, BWR, AGR, CANDU and RBMK reactors. Reactor core inventory and assumed spent fuel pool inventory in the database of ESTE EU is calculated specifically for every one European power reactor (by Scale6/Origen) on the base of information from the PRIS of the IAEA and other gathered information. Radiological impacts are calculated as TICs, deposits, wet deposit on the terrain, dose rates, avertable doses and potential doses. The system enables to display on the map (inside the GIS) meteorological information for the whole relevant part of Europe – in compliance with and according to numerical weather prediction data. The system enables to display graphically on the map (inside the GIS), as blue shade regions, information about the intensity of precipitation – in compliance with and according to numerical weather prediction data. measured dose rates across the Europe (from EURDEP). measured dose rate at given point on the map. EURDEP - Map with sites around Czech Republic where EURDEP system radiation monitors are placed, see https://eurdep.jrc.it. Another possible source of input information can be "Emergency Data Resource" file in XML format, which could be delivered to the ESTE EU from any other ESTE system. This XML file contains information about real release or about predicted release (radionuclide composition of the release, timing, geographical data, effective height of release). to create a new location of release (of event) in any place on the map (Europe). Lagrangean Particle Model (LPM) and Puff Trajectory Model (PTM) are both implemented in ESTE EU.